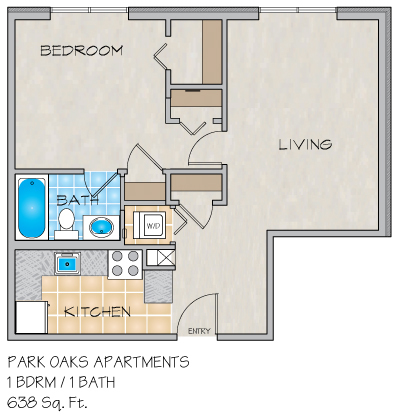 Please send me more information about Park Oaks Apartments. If you are searching for a unique, spacious apartment home with a washer/dryer, Park Oaks is a must see Metairie, LA apartment community. Kitchens are great for entertaining and have a service bar and large pantry. Over-sized, multiple closets are perfect for storage and allow room to grow. Rarely found, expansive bay windows will brighten and heighten your living experience with us. Complimentary off street parking provides maximum convenience. Residents of our apartments in Metairie, LA enjoy living in a park-like setting under majestic oaks. Whether you are an active swimmer, or just enjoy relaxing by the pool, summers are pleasurable here. Jog on Lake Pontchartrain's levee or take a stroll to one of the many wonderful local eateries and entertainment spots nearby. Our on site resident services team is dedicated to providing you with a quality living experience. Our commitment to your comfort is our top concern. With 24-hour emergency maintenance and online services, you will always have peace of mind. If you are searching for an apartment for rent in Metairie, come see for yourself. Relaxing and quiet complex with convenient parking. However, I could hear squirrels or rats in my walls for my entire 10 month lease. Problem was never resolved. On my second year at Park Oaks Apartments. I enjoy living here. Good security purposes, must have key to enter into building, or code to gate. 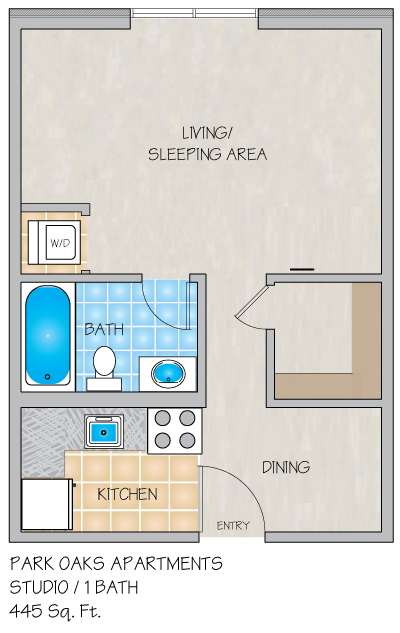 Love the size of the apartment, an the extra closet space. Pool area very nice and tranquil. Nice mailroom on property. Management and maintenance are on top of everything. Walking distance to grocery stores, walk or sit by levee. Great place to live. my experience at park oaks has been great in my one year of living here. the maintenance is very quick and comes as soon as you call. the neighborhood and neighbors are very quiet but friendly. the location is great and close to stores. I'm currently a resident of Park Oaks and I have been living here for almost 4 years. I love the apartment, it's cute and quant and the surrounding neighborhood is very quite. I love the fact that there are washer/dryer in the unit. Another awesome amenity that I love is the fact that it's 5 minutes from downtown. The staff are nice and they handle problems ASAP. 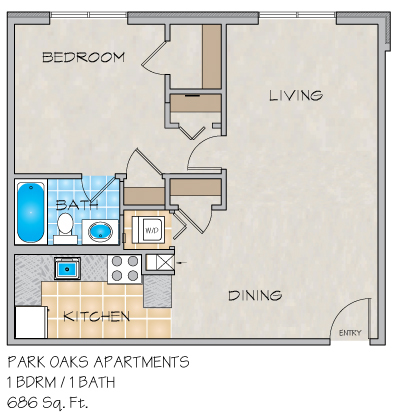 I strongly recommend renting from Park Oaks. I rented here "sight unseen" since I was moving from out of state. I was very happy to find the apartment better than expected! Property Manager, Caitlin went above and beyond to make sure the apartment was "move-in" ready and made my transition here an easy one. The customer service is superb! Park Oaks Park Oaks is a friendly complex. It is pet friendly and the staff is very friendly too. The grounds are always clean and everything is so close such as grocery shops, coffee shops and fast food places, It is also very close to the I-10 close to down town. We been here for 2 years and we love it. It has improved dramatically since the time I got here. It's beautiful compared to then. When they renovated, I wish they'd updated the cabinets and countertops. Now the service is good, and the staff and dealing with the manager is great and has improved. Caitlin responds quickly to my needs and I'm satisfied because it wasn't always like that. We have lived here for 2 years, ever since we moved in we have loved it. The grounds are beautiful full of flowers and always clean. The staff is always helpful and tries to fix any problem within that day. Everyone that lives here is always peaceful and friendly with each other. We love it and are very happy with everything. Great for young and old! Lived at Park Oaks for 5 years and there's a reason, it's perfect. Great apartment layouts, great pricing, off street parking, pool, and great staff. If you have any problems with your apartment call the 24 hr line and someone is there if not within the hour then first thing in the morning. Close proximity to Veterans Blvd and W. Esplanade and I-10. Great place for young and old to live. Greg N.
Been living here for a year at Park Oaks, just renewed lease. The people here are quite, the grounds are well kept. Love that this is a secured building, pool area is nice. Management is pretty much on it when something goes on, they do have 24 hour maintenance. Been living here for 5 years, and there's lots of reasons. Great location, great staff, good rates, pet friendly (dogs under 20lbs), and quiet. Great neighborhood and vicinity to I-10 as well as veterans Blvd and w. Esplanade. Been living at this location for 5 years, think I have been here longer than anyone else. Great place to live that's why I've stayed this long. Great location in vicinity to Veterans Blvd and W. Esplanade ave, as well as I-10. Great layouts, good prices, pool, private parking lot, and secured access. If you ever have a problem they have a 24 hr phone number and if someone isn't there within the hour they are there first thing in the morning. Highly recommended for anyone young or old. The apartment is really quite. Every neighbors are friendly and management is also very kind. My family loves to walk to go to Winndixie store, puccinos, starbucks, PJ's, Mcdonald, or Wendy's, near here, in Veterans Blvd. It is also very convenient to get I-10 toward Baton Rouge and New Orleans, and I-610 to Slidell. We are still enjoying our time in here!! I currently live here. The apartment is really quite. Every neighbors are friendly and management is also very kind. My family loves to walk to go to Winndixie store, puccinos, starbucks, PJ's, Mcdonald, or Wendy's, near here, in Veterans Blvd. It is also very convenient to get I-10 toward Baton Rouge and New Orleans, and I-610 to Slidell. We are still enjoying our time in here!! Great complex and beautiful pool. I love to walk on levee right next to complex! I have lived at Park Oaks for 7 months and love it. The residents are all friendly and quiet. The grounds are extremely well kept up and it is beautiful around pool area. A great mail center which is enclosed. We have a great office manager whom is very friendly and cheerful. I am glad I chose this 1st Lake location. For Lake Ave., this is one of the better looking complexes just by outside appearance. Nice location, close to everything. The landscape is well kept as well as the pool. Units are older, nothing fancy about them. Hallways are stuffy but they are swept daily when maintenance is working. Walls are thin, not bad if you are next to quiet folks but horrible if you are next to or under a loud person. For the price, it is decent but if you want more modern living space, this isn't it. Small community with only studios and 1 bedrooms, which is good because there aren't large families mainly singles and couples and you aren't living amongst hundreds of people. Pretty good bang for your buck with washer and dryer in units and nice sized private patios if on the first floor. I lived in Park Oaks property on Raspberry St from 2009 - 2012. I love the area and the proximity to everything!